I am using Windows 8 in my System. I like to use Virtual Keyboard. It has worked well till one month. But, now I am unable to see it. What might be the Problem? Please, anyone help me in Solving the Problem. How well is the Windows 8 Virtual keyboard is designed? Is it better than in iPad? How to use Virtual machine on my Windows 7 to use Windows XP with Windows 7? Is it possible to change the size of Windows systemÂ’s virtual memory? How to Use Internet in windows 7 installed in virtual Machine? Is it true that Windows 8 touch keyboard is going to be reinvented as Thin Touch keyboard? How to change the Keyboard Input Language from UK to US in Windows 7? What has to be done for activating onscreen keyboard on Windows 7? # Open the On-Screen Keyboard over the Win-8 Start Menu. Press the key combination [Windows-Logo]+[R] and type the following command: osk and then confirm by pressing[Enter]. 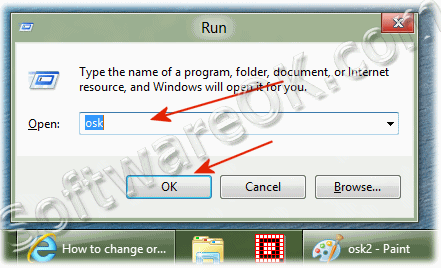 Start the On-Screen Keyboard over Windows-8 RUN! 3. # Call the On-Screen Keyboard over Windows-8 Explorer! Press the key combination [Windows-Logo]+[E] then tap it into the address bar "osk" and confirm with Enter. Open the On-Screen Keyboard via Windows-8 CMD! How to find the missing file in my Windows PC which is there in my system but not visible? Is there any way to do it?